Linking us functionally to that enhanced view of ‘self-government’ from the last post, UNESCO wants to “explore new or renewed ideas, values, attitudes, behaviours, and models, and through these to address the challenges faced by the international community.” That means UNESCO loves concentrating on local officials with political authority over just those very things. In fact, the local is probably the easiest domain for a philosophy that “seeks to create their own future…It is a resource for all individuals and all communities to pursue their own progress and development. This presupposes social inclusion of everyone and at all levels of society.” When Irina Bokova became UNESCO Director-General in 2009, her installation speech should give us all pause, especially when education is now collecting the very kind of learner analytic data in student-centered learning pilots that reveals whether her desired aims are being met. Bokova had plans “for bringing people together and sharpening their conscience with regard to the potential of a world based on peace, democracy, justice, and human rights.” If conceptual frameworks and Disciplinary Core Ideas for math, science, and history, just to give 3 current examples, are no longer actually about the transmission of knowledge as this article https://townhall.com/columnists/janerobbins/2018/06/05/whats-wrong-with-common-core-math-n2487580 still asserts misleadingly, but rather topics that can be used to solve everyday current problems and image the future as UNESCO keeps asserting, then all of these intentions are already in play unbeknownst to most of us. If Bokova stated that it is “through the nature of their intentions and the strength of their will” that UNESCO intends to work and ‘their’ refers to human beings generally and her desire to see “peace constructed in the minds of people” we better be paying attention to those goals when all the elements are in place or are being put in place by advocates complaining in the US about SEL abuses or the need for stronger data privacy. Remember what I said about Beware of the Offered Remedy? https://pulse.microsoft.com/uploads/prod/2018/03/WorkProductivity_GDPRforEducation_KickStartGuide.pdf shows that Microsoft regards GDPR as beneficial to its business much like how Brer Rabbit felt about that Briar Patch. After all, it even boldfaced that it has the most comprehensive set of compliance offerings of any cloud service provider. Want to make sure a school or other online education provider is in compliance with GDPR? Just load all that data gathered to Microsoft proprietary servers and they will see that you “meet your GDPR requirements.” In all my prowling across the Internet in the EU I could not find any provider who did a good job describing the nature of the data being gathered in the name of “learner analytics.” Just that the student or parent acknowledged it was being collected and was integral to the desired changes education hoped to achieve in the student. Not much of a remedy so far, is it? But wait, just like those Ronco holiday commercials when we were younger, there’s more! https://news.microsoft.com/en-au/features/microsoft-launches-transforming-education/ came out on June 5. Along with a greatly revised vision of education for the 21st century, it provides us with a new term to get us there–the Analytics Trinity. The latter bolding is what the Gates Foundation regards as student achievement globally and what will be called in the US–Success for All Students–under the various state plans that become operative in the upcoming 2018-19 school year. In other words, this summer is actually a crucial time for parents to toss away the false narratives and start listening to what connected organizations are saying they intend to do in the name of education, data, student-centered learning, and the future. Not to pick on Mr Horowitz since I also found that exact same quote as an education aim in in The Conservatarian Manifesto. See why I am so worried about the remedies being put out now? Last week, we had yet another monumental school tragedy and, as always, one of my first reactions besides grief was to look at which of the poisonous behavioral science theories and models were being pushed in those schools. 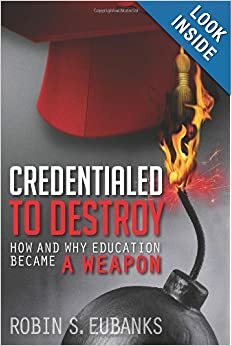 Transformational Outcomes-Based Education was a phrase used more in the 90s version of these same change-the-child reforms that I covered thoroughly in my book Credentialed to Destroy: How and Why Education Became a Weapon. Tranzi OBE is simply my shorthand nickname because it really is ubiquitous in its use even though the names used to describe it change. Having attended Restorative Justice programs here in Atlanta that would supposedly cure the School to Prison Pipeline, I did a search involving Broward County Schools. This post’s title comes from the motto used by Broward’s exemplar (which got Superintendent Runcie invited to the White House in 2015) PROMISE Program. PROMISE is an acronym for Preventing Recidivism through Opportunities, Mentoring, Interventions, Support & Education. According to a February 18 Washington Post “Teacher’s say Florida suspect’s problems started in middle school, and the system tried to help him,” Nikolas Cruz “was entrenched in the [PROMISE] process for getting students help rather than referring them to law enforcement.” In the previous two posts, I have been warning that the focus hiding behind phrases like Evidence-Based Policymaking needs to be on the model or theory being implemented–What is the desired change being sought? That’s how I can recognize that motto as grounded in Tranzi OBE because it assumes the key to controlling future behavior is to get at students’ underlying beliefs and values and to ground future decision making in emotion. Get at what drives attention and intention and then provide new experiences until the desired assumptions become Habits of Mind. It is what the PROMISE Model will call “more effective coping skills and pro-social behaviors”. The e-book Eliminating the School-to-Prison Pipeline published by BCPS can be found here https://www.browardprevention.org/behavior/promise/ and I especially want to call attention to an assumption of the PROMISE model that seems tragically mistaken after Parkland. Let’s bold for emphasis– This approach focuses on the situation being the problem rather than the individual being the problem. Translated that is a theory of human nature that assumes that people are not evil, circumstances are and that if environments can be changed and people can practice new behaviors grounded in new beliefs and values (Broward also uses Singleton’s Courageous Conversations on Race), people can change. After 17 murders and an intention to commit many more, does it make any sense to be using an education model that asserts that the individual is not the problem? I am going to quote from the beginning of that book because I truly believe there is a reason that school mass shootings always seem to occur in districts pushing Tranzi OBE as the new template of education. It is a manipulative, flawed view of human nature that fits a society where too many people want to steer people and institutions through the political process. These italics and bolding are in the original. intervention programs and wraparound services for identified youth. related arrests are detrimental to student success in school and in life. disabilities, and LGBT students in discipline. If the Restorative Justice or Tranzi OBE models for education are harmful and push social theories with deadly results, adhering to them is still evidence-based policymaking. That’s why appreciating the errors in the underlying theory or model is so important. There are 17 fine people who have had their futures more than sabotaged by Nikolas Cruz’s intentional behavior and the flawed template being used to supposedly obtain Equity in education results cannot be ignored amid cries of gun control. I believe that’s also why we have seen so much conflation in the last week as if gun violence at schools and intentional mass murder in schools to kill students and teachers are equivalent and synonymous. Shouldn’t these practices grounded in behavioral science and flawed assumptions that people can be treated as ‘systems’ be reexamined instead of blindly calling for gun control? The same Behavioral Scientist publication that wanted to force Charlottesville Conversations that were all some how created before the August tragedy on all K-12 schools and classrooms insisted yesterday that we remember that mass shootings are NOT a product of mental illness. http://behavioralscientist.org/myth-mental-illness-causes-mass-shootings/ That’s reality getting in the way of a useful theory for social change, isn’t it? Parkland and the media manipulation of this tragedy to support an existing agenda means that the existing agenda should be the focus of our attention. Why must the Tranzi OBE template always be protected as the new focus of K-12 schools? Why is no amount of innocent blood ever enough to force a reexamination? The same learning models that created Tranzi OBE, PROMISE, and Restorative Justice practices have been quietly embedded in every state plan I have looked at under ESSA, the new federal education law. We must be able to address what is wrong with these theories of behavioral and social science in a society with genuine aspirations of freedom for each individual. Contrary to what too many professors in higher ed are teaching too many students, the 21st century should not be an experiment in social transformation if only the correct public policies can be enacted. If education to implement “a new, transformational theory of change” keeps coinciding with mass school shootings, why on earth are we refusing to take a hard look at that underlying theory of change and the techniques it is using?